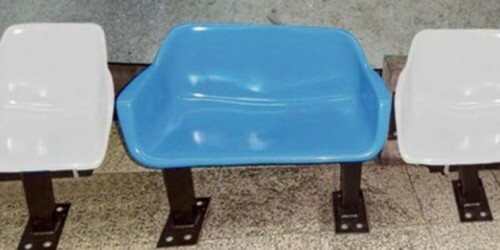 Brazilian authorities have inserted a number of ‘double wide’ seats into the stadiums being built for the 2014 World Cup so that even the most portly of fans can watch the tournament from the stands in comfort. For example, there are 120 of the XXL seats at the 64,000-capacity Castelao stadium in Fortaleza – one of only two stadiums which have actually reopened since redevelopment began ahead of the World Cup next summer. The seats are actually mandatory under Brazilian disability laws (it’s a legal requirement that at least 1% of the total seating must be set aside for heifers) , though that doesn’t stop them being double the price of a normal seat . Whereas you’re looking at paying around £19 for standard fare, the super-sized seats will cost you around £38 – presumably on the basis that if you’re going to take up the space of two people, you’re going to have to bloody well pay for the space of two people! Now, who do we ask about obtaining a £57 chair? It’s for…um…a friend. This is ridiculous, if I owned a stadium I wouldn’t let them in. So even if Frank Lampard doesn’t make the England squad, he’ll still be able to watch our inevitable quarter final exit in comfort. 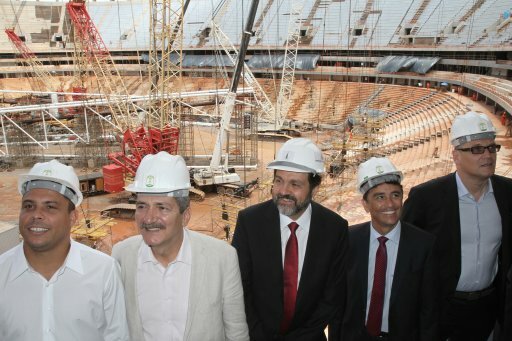 Is that Bebeto second from right? cor, i was getting really wound up reading that…and then i saw they have to pay more. phew. some common sense. luckily i’ve never had the misfortune of being stuck on a plane where one has tried to squeeze in to their seat, with their blubber hanging over the arms into other peoples territory. it might be nice for normal people though, you could take a cushion and have plenty of room to put your drinks/food next to you.